The apartment was extremely comfortable, home from home, I would almost say too comfortable as my wife made a list of ideas she will have me doing 😄 We are visiting barrow in furnace in May and are gutted the apartment is not available. Very clean and comfortable. Staff were easy to contact, would recommend. 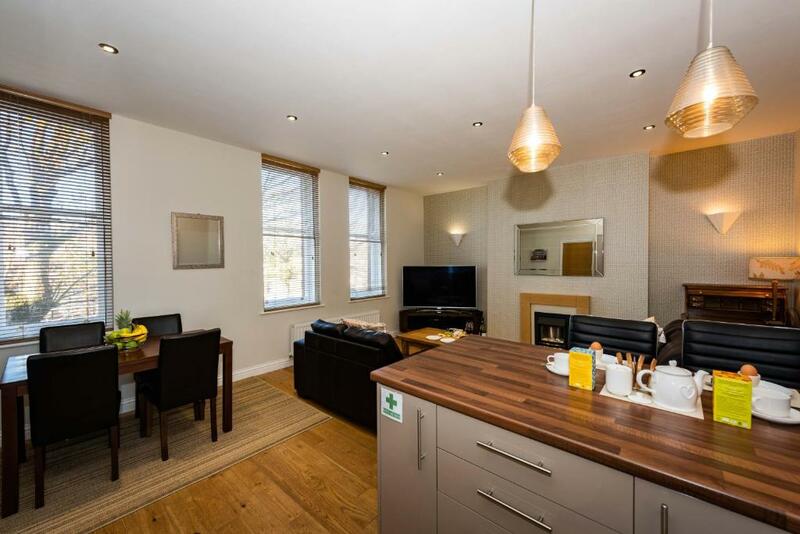 Great location to the town centre. Apartment was comfortable and had everything you need. Hosts were very friendly and very helpful. Very clean and to a high standard and perfect and convenient location as we were attending a wedding at abbey house. 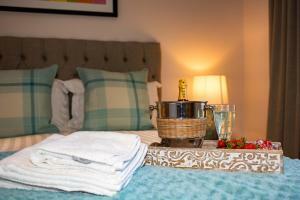 Lock in a great price for Abbey Apartments - rated 9.5 by recent guests. 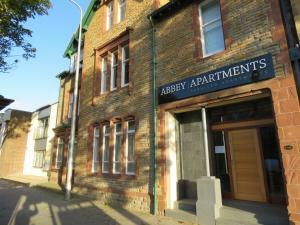 Abbey Apartments offers accommodation in the central conservation area of Barrow-in-Furness Furness. The property is located within 200 yards of the area's retail parks, bars, restaurants and shopping centres. The railway station is 350 yards away. 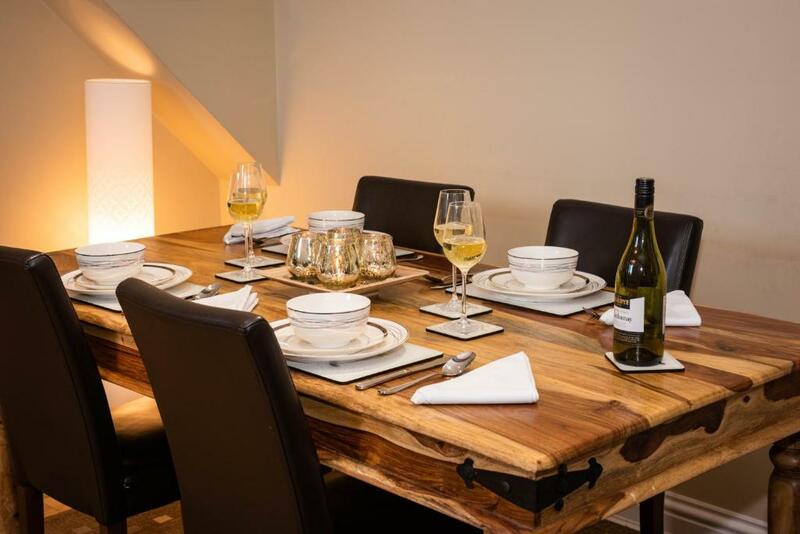 Each modern self-catering apartment at Abbey Apartments features natural oak wooden floors and a contemporary decor, a large lounge with a 50-inch TV with Sky channels, free WiFi and leather sofas. There is a kitchen with a fridge, microwave, hob, oven and a washing machine. The property is centrally located to multiple corporation offices and tourist attractions. Secure private parking is provided for up to 13 cars. Furness Abbey, The Dock Museum, a golf club and miles of coastal beaches including other tourist attractions are located within 2 miles of the apartments. 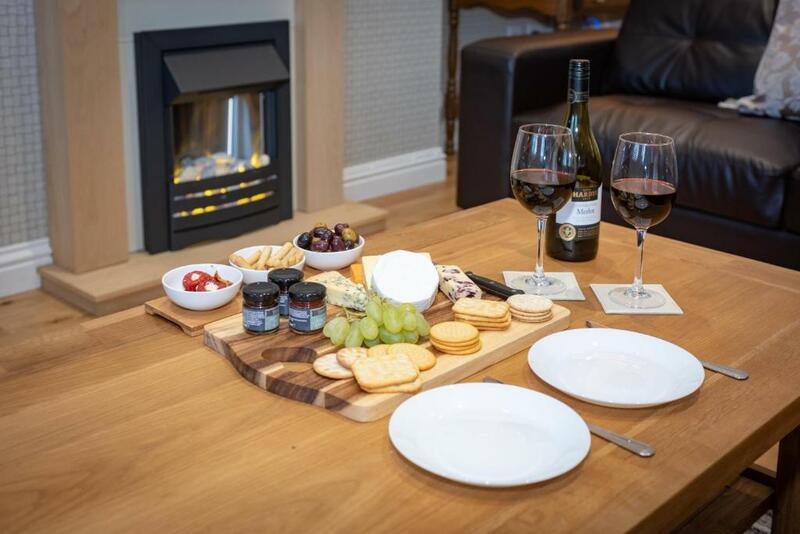 This property also has one of the best-rated locations in Barrow in Furness! Guests are happier about it compared to other properties in the area. This property is also rated for the best value in Barrow in Furness! Guests are getting more for their money when compared to other properties in this city. Abbey Apartments has been welcoming Booking.com guests since 24 Nov 2015. 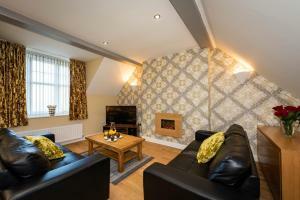 When would you like to stay at Abbey Apartments? 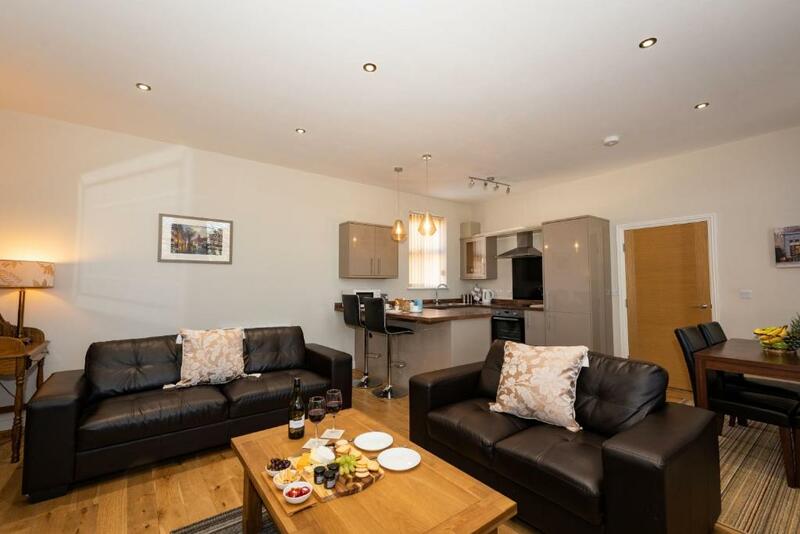 This apartment features a electric kettle, kitchenware and toaster. This apartment features a microwave, view and soundproofing. This apartment has a electric kettle, oven and washing machine. Abbey Apartments Consist of 7 high specification apartments in a Aristocracy Residence of days gone by. Three apartments exude traditional style and design quality whilst the 4 new apartments emphasis modernity, technology and luxurious comfort and practicality. In its now modernised state the 7 apartments are all unique. There are 2 Penthouses, 2 Executive suites.and in all a mixture of 4 x 1 Bed & 3 x 2 Bed Apartments that easily rival London / New York Apartment design and quality. .
Dear Guest, My name is David Clark and I have been developing Property for wealthy clients for the last 16 years. I have returned to my home of Barrow to give the town something back in terms of my putting forward my experience in providing high specification, modern design, luxury apartments. I am very pleased to have completed both Phases of the development which is located on Abbey Road in the centre of Barrow immediately next to BAE and the docks complex. The local neighborhood is a real contrast of superb Victorian buildings of Granduer , the buildings and harbour sides of BAE (500 yards) and modern retail parks offering boundless shopping. Abbey Road is the main transport route into the town centre and only 100 yards away can you find the heart of the tow, all modern retail outlets including , Next, Tesco, KFC, Pizza Hut, Costa Coffee, Frankie & Benny's, Dunelm Mill, VUE cinemas, Maplin electronics, Halfords, Curry's and TK Max. But you will also find a selection of Pubs and restaurants that offer excellent food and value for money including, JD Weatherspoons, The Drawing Room, The Custom House, The Nines Cabaret and night club and Manhattan's Barrow's famous nightclub for the young or young at heart. The railway station is just a 5 minute walk as well as bus stops leading to all location in the Furness and Cumbrian area. All in all this location is absolutely central to everything that is work rest and play in this ever growing and regenerating town. 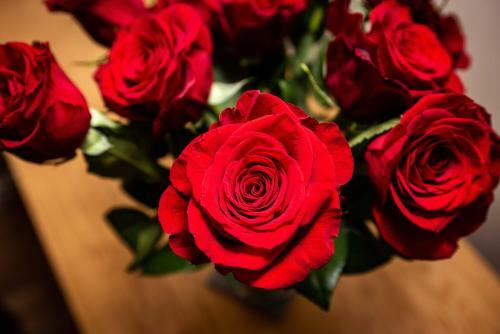 House rules Abbey Apartments takes special requests - add in the next step! A damage deposit of GBP70 is required 7 days before arrival. This deposit is fully refundable during check-out as long as there has been no damage to the property. Abbey Apartments accepts these cards and reserves the right to temporarily hold an amount prior to arrival. Please inform Abbey Apartments in advance of your expected arrival time. You can use the Special Requests box when booking, or contact the property directly with the contact details provided in your confirmation. A damage deposit of GBP 70 is required. The host charges this 7 days before arrival. This will be collected by credit card. You should be reimbursed on check-out. Your deposit will be refunded in full via credit card, subject to an inspection of the property. The bathroom sink if you turn the tap on to much you get soaked. Pillows are not very comfortable. The overall stay was superb. Wonderful apartment, good facilities including very large screen television and private free parking spaces. ASDA and other stores are only a few minutes drive. Highly recommended for someone planning a day trip to lakeside or Windermere both reachable in an hour's drive even with the current road closures. Louise has been extremely helpful as well including the support provided during out of working hours. Not getting the £70 deposit back for a cheap door handle coming off the door to turn on the hot water, ended up with no hot water on the 2nd night! And no heating, tried opening the door to put the heating and hot water on and the handle came off.